On August 5, 2002, the deacons brought their recommendation for Rev. 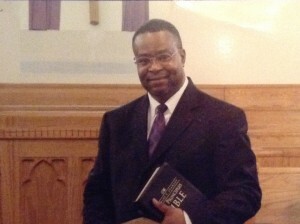 Rayfield Walker to become pastor of Beth Salem Baptist Church and it was posted. Rev. Walker gave the church a letter of acceptance on September 1, 2002. Under the leadership of Rev. Walker, the church has continued to grow in the Spirit of Christ, in attendance, and in giving through the principle of tithes and offerings. The pastor worked with the deacons and purchased land on Garland Street to enlarge the church if need be. The church now has its own web site: www.bethsalem.org. Our church ministry has continued to bond thru fellowship by having picnics, taking trips to Washington, D. C. again in 2013, and Atlanta, Georgia in 2014. Headquarter for support of The W.O.R.D (WHOLENESS,ONENESS, RIGHTEOUSNESS, & DELIVERANCE). The Word Program is a research project to figure out the best ways to help people lose and maintain their weight through growing closer to God. Several ministers have been ordained in Beth Salem Baptist Church down through the years also. Our church is insured by church mutual, and our treasurers are bonded. Thank God we have come a long way. Let us continuously grow in grace and knowledge of our Lord and Savior Jesus Christ.